Her Majesty was not the only one celebrating a major anniversary in 2012. 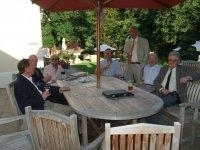 On July 19th 1962, just over 40 senior boys left HCS. 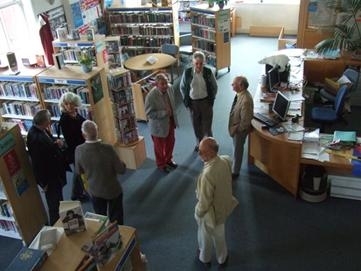 Fifty years later, ten old aged pensioners returned to celebrate their school days. Sadly, a few of the Class of 62 are already dead, several left these shores, and a number have not kept in touch with the school; so all in all, it was a satisfactory turnout. Unfortunately Bill Glover, one of the three extant masters from our era, had to withdraw at the last minute. The day started with a sherry reception hosted by the school in No 1 Castle Street, where we enjoyed looking around the OH Museum, in what used to be Mr Peebles’ study: a wary eye was kept to make sure the cane remained on the wall. Next was a picnic, wisely transferred inside the Old Deanery because of inclement weather; strawberries and coffee kindly provided as a final treat by the school. After lunch we were given a tour of the school. ‘Big School’, where the whole school (c. 350 boys in 1962) would gather for assembly, seemed to have shrunk – especially as we had just seen the cavernous new (at least to us) sports hall behind No 1 Castle Street. Big School, now part of the Gilbert Library, had undergone considerable renovation and bore little resemblance to School House’s prep room and boarders’ Saturday evening cinema. Since 80% of those attending were from School House, we had a good look over our former home. Sadly, parts looked in need of TLC; some of us thinking it more dilapidated than in the austerity times of the 1950s. We laughed at a sign at the entrance to what were the bike sheds, proclaiming NO SMOKING: this area was the former haunt of School House smokers, who could be identified by their purchases of Extra Strong Peppermints at the tuck shop. Also found amusing was the sign by the changing rooms saying LADIES – if only, fifty years ago! 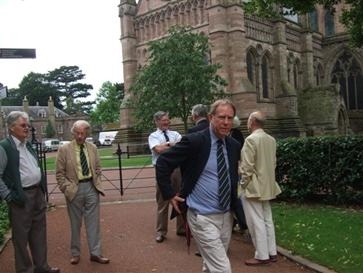 The Old Deanery was represented by Michael Hankinson, a former chorister and now a well-known man of music living in South Africa. 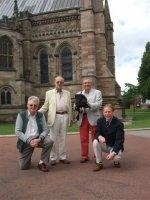 Fortunately, Michael was able to make the long trip because the Three Choirs Festival was held at Hereford this year. Barrie Jenkins (West House) did an excellent good job representing dayboys, and was adopted by the boarders as one of their own. Though sad that dayboys were so underrepresented, it is probably not surprising, since school was also home to boarders, and contemporaries like family. Lunch was walked off by a visit to Wyeside, taking in the boathouse en route. On the way back, we decided to follow the circular-route punishment run called ‘The Bridges’: across the Close, over the old Wye Bridge, along Bishop’s Meadow, over Victoria Bridge, and back via Castle Green before breakfast. Fortunately, the pace was less than demanded by monitors in the 1950s, and there was more than a cup of tea to follow. 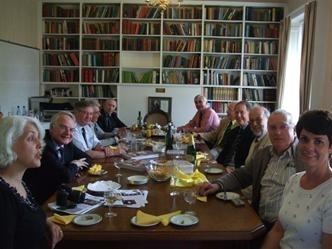 A first-rate full English Hereford Breakfast and more talk were enjoyed before we departed Hereford, 50 years to the day of leaving school. 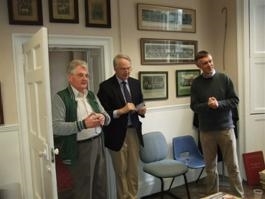 A measure of the success of the Reunion was talk of reuniting in 2022 to celebrate our Diamond Anniversary. We are all extremely grateful to Helen Pearson and Claire Morgan Jones who gave me so much help to organise this very enjoyable reunion. 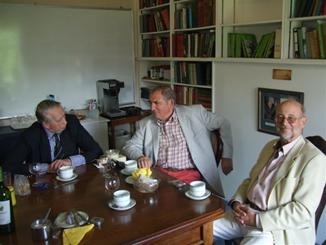 Charles Swabey and Richard Blott (pictured with Des Whetter), could only join us for the lunchtime engagements. School House guys at the Old Deanery: whatever next? Howard Griffiths is keeping his hand on his wallet.